After the annoyance of being ripped off when we arrived in Marrakech, we decided to take the safe option and asked our riad to meet us at the train station. A short car journey (to the right place) and being escorted to the riad meant that my first impressions of Fez were much more favorable. 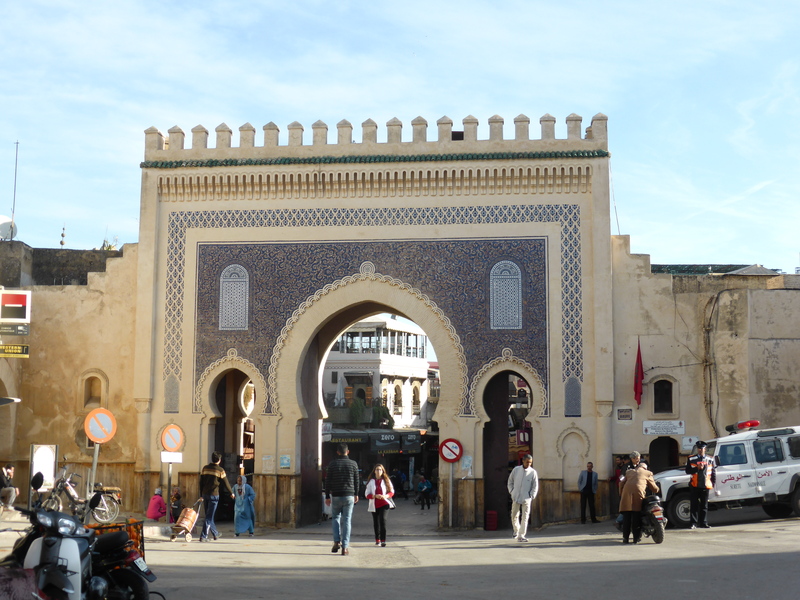 I also found that I preferred the souks in Fez. The streets are narrower and you only have to worry about donkeys, not being hit by motorcycles. We did a full exploration of the medina and may possibly have passed through the same streets three or four times whilst finding our way but I enjoyed looking at the various goods for sale – the colorful fabrics, metalwork, mirrors and, of course, the food market (although the camel’s head on a meat counter was disconcerting). Part of me regretted that I wasn’t self-catering when I saw the fresh herbs and vegetables, and smelt the pungent spices. Ah well, maybe another time. 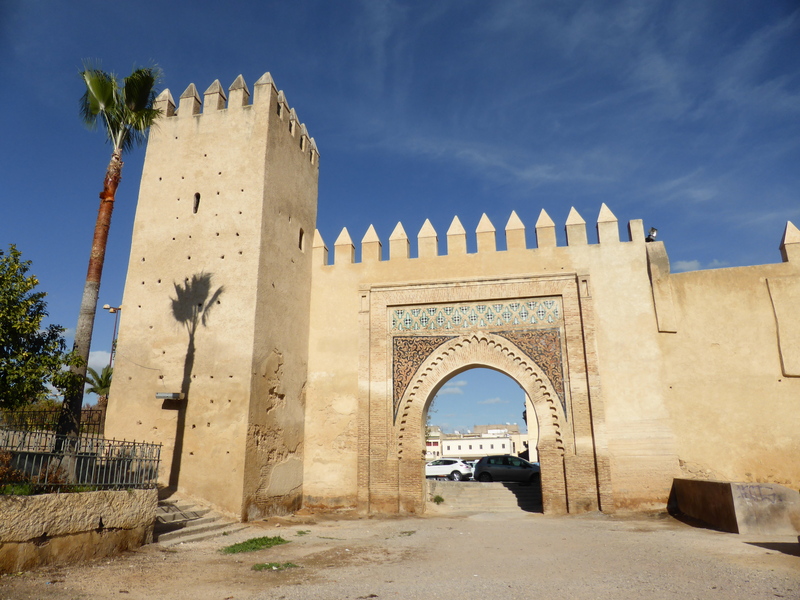 Our riad was located close to the Bab Boujloud (Blue Gate), one of the principal entries to Fès el-Bali (Old Fez). There were a number of restaurants aimed at tourists just inside (which despite efforts at persuasion, we managed to bypass) but you were soon able to immerse yourself in the colorful souks. We did venture to the Ville Nouvelle one day but it was nowhere near as nice as the one in Marrakech. From the terrace of our riad, we could see the Merenid Tombs so one morning we wandered up the hill for a closer look. 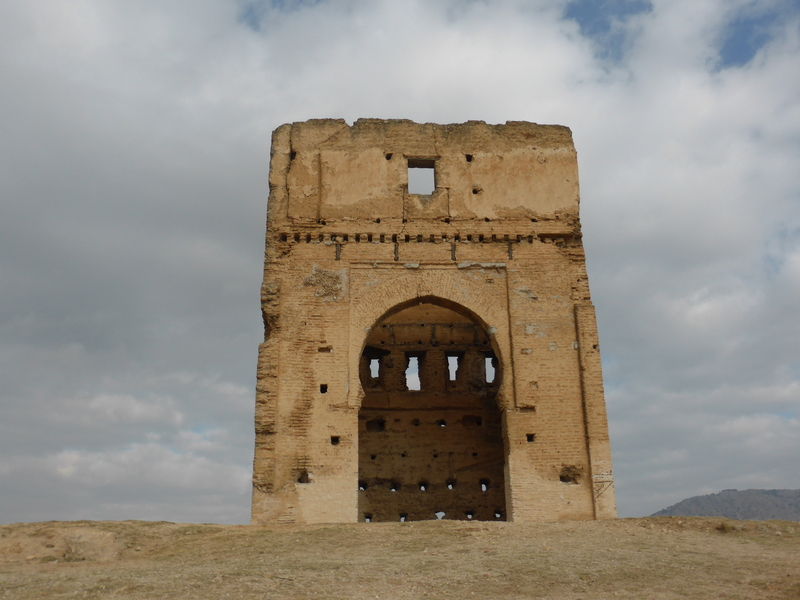 The ruined structures themselves were impressive but their location gave us great views over Fez and, in particular, the medina. One of the biggest advantages of our riad was its close proximity to Café Clock with its fabulous display of trumpets. This quickly became our favorite place to hang out. The coffee was good enough to impress my traveling companion and the food was excellent. We may or may not have eaten here three or four times during our stay in Fez. The Café is spread over three levels with a rooftop terrace and a lovely welcoming atmosphere. My personal favorites were the lamb burger and the caramelized banana pancakes. 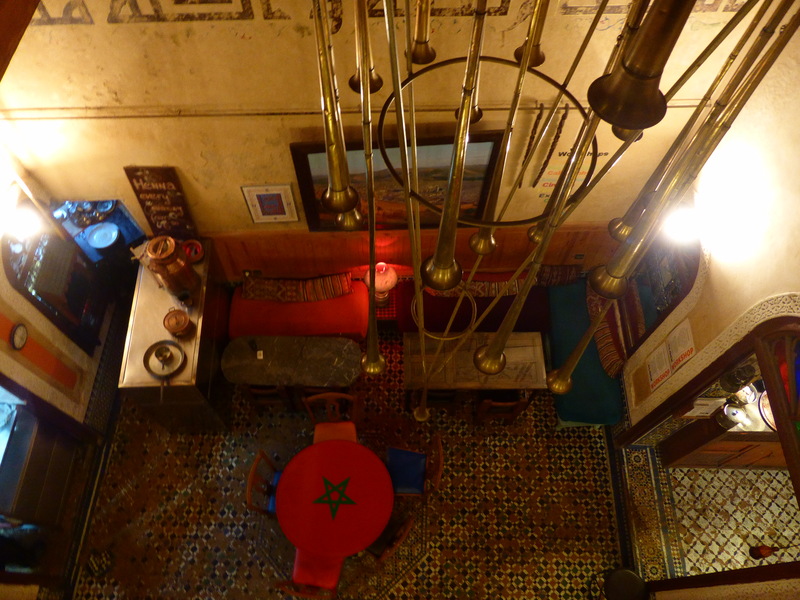 We liked it so much that when we went back to Marrakech we went to Café Clock there as well. We stayed at the Riad Noujoum Medina which was much larger than the riad we stayed at in Marrakech – there were a lot of flights of steps to reach the terrace for breakfast! But the views were worth it. The internal courtyard had lots of comfy sofas for relaxing after a hard day’s sightseeing. Our room, which was thankfully on the ground floor, was on two levels with a mezzanine for sleeping. Fabulous! The riad was in a great location for exploring Fez and I would happily return.